Properly installed gutters are vital to the protection of your home. Improperly installed or poorly maintained gutters will clog, flood, and eventually do major damage to the walls and foundation of a home. Water that isn't properly directed also damages landscaping, driveways and other home and yard features. This kind of damage can cost thousands to repair. Even a properly installed seamless rain gutter can clog and overflow if it is not appropriately maintained. Gutters must be cleaned on a regular basis in order to offer maximum protection. Luckily, there are a few Gutter Protection Systems on the market that are designed specifically to help the homeowner keep gutters clear and free of debris. Protecting your home with rain gutters is a great way to prevent water damage around your home. Water can destroy landscaping and foundations if not properly directed away from the home. When you do this you should go the extra mile to protect your gutters too. There are several alternatives for protecting your gutters from dirt, leaves, twigs, ice and small animals. They also give you the luxury of lower maintenance due to having less debris in your rain gutters. 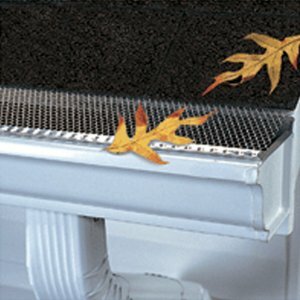 Some gutter protection alternatives include; screens, covers, toppers, and fillers. It will be a matter of choice to which system you would want to go with, there are also several manufacturers that make these products so you should be able to find the right system for your home. screens come in different materials such as; vinyl, steel, aluminum and plastic. Covers come in different styles; some systems have a rounded nose that directs water into a narrow longitudinal gap. Others have louvered slots or perforated openings, either way they function the same by directing water into the gutter while filtering out the debris. Toppers these are similar to covers but have a flat smooth surface and slots on both sides to allow snow and ice to slide off and allow high water flow in. Fillers one of the newest systems is a material that fits into the gutter and is flush with the top, it is a very porous material that only allows water into your gutter system. Regardless of which system you choose, most come in a variety of materials and colors to match your gutter system. Your gutter contractor can help you with styles, colors and pricing. So protect your rain gutters and you will have the piece of mind of low maintenance and longevity of your rain gutters. Serving Dallas and surrounding communities. © Bell Raingutters™ 1997 All Rights Reserved.